Gas prices pinching your wallet? Here’s how much you could save with an electric car. Canadians can expect to spend around $300 a year in electricity costs to power up their planet-friendly cars, according to Kristine D’Arbelles of the Canadian Automobile Association (CAA). That’s one-tenth of what the typical pick-up truck driver spends on gas. In general, operating an electric vehicle (EV) costs one-fifth or less of what it would take to fuel an internal combustion car, said Ron Groves, director of education and outreach at Plug N’Drive, a Toronto-based non-profit that promotes information about electric and hybrid vehicles. 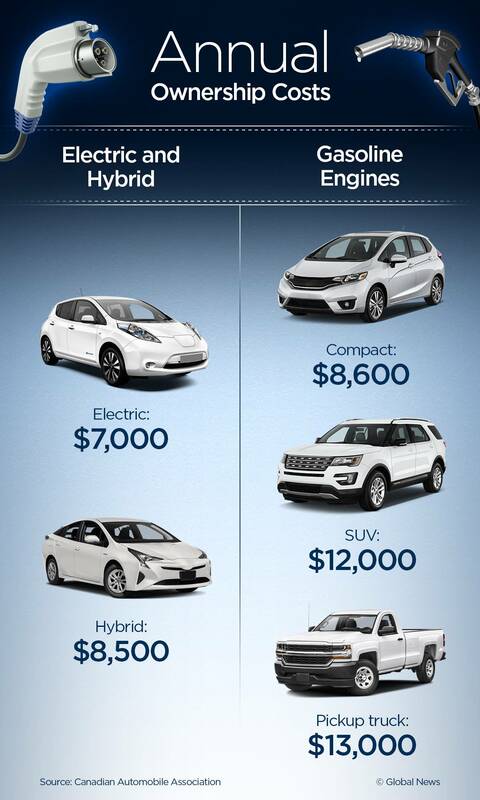 But will an electric or hybrid vehicle save you money once you factor in purchase and maintenance costs? Global News took a close look at pros and cons of choosing battery over gas. Owning an electric or hybrid vehicle could save you hundreds of dollars a year in ownership costs (including depreciation), according to numbers provided by CAA. The main saving from electric and hybrid vehicles comes from fuel costs, D’Arbelles said, but maintenance is another important factor. Electric cars need far less upkeep than their gas-guzzling counterparts. There’s no need for tune-up or oil changes, and even your brakes will last longer. Because EVs slow down when you ease pressure on the accelerator, drivers tend to coast to a stop, rather than slam on the breakes, which results in less wear and tear, Groves said. 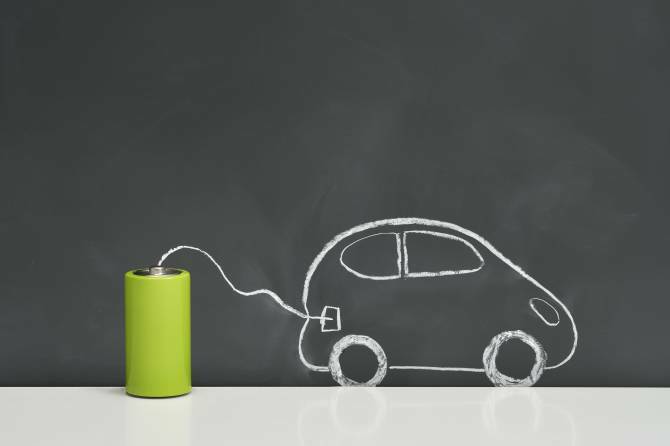 For hybrid vehicles, both fuel and maintenance costs depend on how you use your vehicle. CAA’s annual cost estimate assumes someone does 50 per cent of the driving in battery mode, with a 60/40 split between highway and city driving. The one maintenance or repair cost that EVs that do come with is a hefty price tag for replacing the battery. The cost of getting a new one is currently pegged at $10,000, said D’Arbelles, although prices are expected to drop significantly by 2020. Still, EV batteries come with an eight-year manufacturing warranty, and will probably last far longer than that. Batteries degrade slightly over time, so an EV with a range of, say, 380 kilometres might lose 20 per cent of battery capacity over 10 years. But that would mean the car still has an 320-km range, which might still be plenty for many drivers, Groves said. In the end, your car’s body, rather than its battery, might dictate how long your car will ultimately last. After all, this is Canada, where snow, ice and salt tend to shorten any vehicle’s life span. Your electric ride will eventually rust just like any other car. For years, driving what’s good for the climate has been a luxury only the deep-pocketed could afford. And although EV and hybrid car costs have been coming down – they declined by about 10 per cent between 2016 and 2017 in the U.S. – Canadians are still looking at $32,000 and up just for a compact sedan. Luckily, government incentives can be quite generous. Quebec, Ontario and B.C. all offer financial incentives for buying EV and hybrid vehicles. Quebec offers up to $8,000 for buying a new electric vehicle and up to $4,000 for purchasing a used one. In Ontario, buyers will get up to $14,000 for vehicles with a base price under $75,000. In British Columbia, the government will chip in up to $5,000 of a fully electric or hybrid vehicle and $6,000 for a hydrogen fuel cell vehicle. And all three provinces also offer vehicle charging incentives. “That takes some of the sting out of the cost of buying,” Groves said. Some insurance companies are offering EV and hybrid vehicles discounts. Drivers might be able to get a discount of up to five per cent on their policy through programs like the Green Car Discount offered by TD Insurance, Groves told Global News. This is the well-known drawback of green cars: The battery will only get you so far and you might have a hard time finding a place to plug in when you need a recharge. While powering up your ride for your daily commute is easy (just leave you car plugged in at home at nighttime), road trips are another matter. Natural Resources Canada, for example, boasts that “Canada’s growing electric vehicle infrastructure now has charging stations ranging from St. John’s, Newfoundland and Labrador, to Victoria, British Columbia.” Tellingly, though, the ministry’s website also has a map for motorists to plan their route based on available charging stations. If you’re looking for a vehicle that will haul your kids to the family’s remote cottage, you might want to opt for a hybrid. Still, a little-known fact about battery-powered vehicles is that when you slow down, the engine uses the car’s kinetic energy to generate new electricity. While being stuck in stop-and-go traffic will only drive up your fuel consumption costs in a traditional vehicle, it will actually increases your driving range in an electric car, Groves noted. Another downside of going electric is that the number of EV or hybrid vehicles available in Canada is still limited. The Mitsubishi Outlander plug-in hybrid is the only SUV available at a base price under $45,000, according to Plug N’Drive and it only became available this year. Another thing to keep in mind: Your subsidy might affect the resale value of your car. If someone knows the government gave you a $14,000 discount, “they won’t want to pay [you] the value based on the sticker price,” Groves said. Another downside of government subsidies in Canada is that they’re subject to fickle provincial politics. In Ontario, for example, Progressive Conservative Leader Doug Ford has pledged to scrap the province’s cap-and-trade program if he wins the upcoming June 7 election. That could mean the end of Ontario’s electric car subsidy program, which draws funding from the cap and trade program, Groves said.